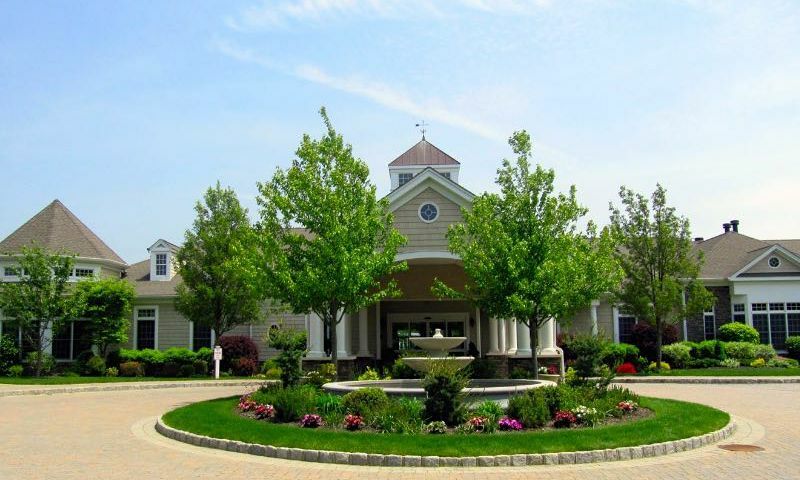 Encore Atlantic Shores in Eastport, New York is a 55+ active adult community located on picturesque Long Island. Constructed between 2004 and 2011, Encore Atlantic Shores offers over 200 luxurious low-maintenance townhomes in a private setting. This outstanding community offers an attractive lifestyle for active adults with a zest for life. Homebuyers who are seeking gorgeous homes with world-class amenities in a desirable location should look no further than Encore Atlantic Shores. The 12,000 square-foot clubhouse is the focal point of all community social and fitness activities. The beautiful facility provides the perfect environment for the residents of Encore Atlantic Shores to relax, explore and play with new friends and neighbors. It includes a meeting room, hobby and game room, card room, library, and ballroom. Residents can work up a sweat in the fitness center or swim laps in the indoor pool then relax their muscles in the sauna or steam room. Surrounding the Encore Atlantic Shores' clubhouse are tennis courts, bocce ball courts and horseshoe pits. The outdoor resort-style pool is a popular hangout for residents on hot summer days while the covered outdoor patio is perfect for happy hours with friends. There is even a putting green for golf lovers to practice their game. Encore Atlantic Shores encompasses 240 townhomes within the community gates. The builder, WCI Homes, completed construction of the community in 2011 but a variety of pre-owned homes are available on the real estate market. There are six floor plans that range from 1,424 to 2,709 square feet. These elegant homes have two or three bedrooms, two or two-and-a-half bathrooms and an attached one or two-car garage. Many of the homes feature spacious living and dining rooms, gourmet kitchens and private master suites. Some homes also feature a loft space that is perfect for an extra bedroom or storage. There is a unique spirit at Encore Atlantic Shores that creates a feeling of purpose and optimism that comes from making meaningful connections and growing as a person. Residents have the opportunity to be part of a community that cultivates well-rounded lifestyles. There are a handful of clubs and interest groups that include exciting options such as book club, bowling, card games, yoga, and wine-tasting parties. The community features many amenities and social events to keep its residents happy, healthy and busy. Encore Atlantic Shores in Eastport, New York enjoys an ideal location on Long Island just miles away from the renowned South Shore beaches. Residents can enjoy a terrific meal overlooking the water, take a stroll on the sandy beaches, shop until they drop in The Hamptons, or experience the many cultural attractions throughout the area. Many residents enjoy weekend trips to New York’s big-city attractions, as well as New Jersey. Closer to home, a variety of retail shops and services, including medical facilities, are within a short drive of the community. Some well-liked attractions in the area include The Big Duck, Grumman Memorial Park, Old Schoolhouse Museum, Railroad Museum of Long Island, Brookhaven Volunteer Fire Museum, and Theatre Three Productions. Encore Atlantic Shores is a wonderful resort-style community in a much sought-after area in Eastport, New York. Clubhouse - 12,000 Sq. Ft. There are plenty of activities available in Encore Atlantic Shores. Here is a sample of some of the clubs, activities and classes offered here. The builder, WCI Homes, completed construction of this 240-home community in 2011 but a variety of pre-owned homes are available on a resale basis. There are six floor plans that range from 1,424 to 2,709 square feet. These elegant homes have two or three bedrooms, two or two-and-a-half bathrooms and an attached garage. Many of the homes feature spacious living and dining rooms, gourmet kitchens and private master suites. Some homes also feature a loft space that is perfect for an extra bedroom or storage. We purchased a home at the Encore in Eastport 6 months ago. We could not be happier! The community and clubhouse are beautiful. There are many activities, luncheons, trips, and special events to attend yearly. The people who live here are the most friendly you will ever meet. The grounds are well kept and the management responds to anything quickly that is reported by the residents. It is close enough to Patchogue Village and Riverhead for shopping and restaurants; yet far enough to have that out east atmosphere. We purchased a townhome here 4 years ago and are very happy with it. At that time we got a great deal! The location can't be beat, it's accessible to the beach, the Hamptons, NYC and Jersey. We use the clubhouse a lot, I can't imagine having to actually drive to a gym after living here. Everything is so convenient and really well maintained. It's a great community. 55places.com is not affiliated with the developer(s) or homeowners association of Encore Atlantic Shores. The information you submit is distributed to a 55places.com Partner Agent, who is a licensed real estate agent. The information regarding Encore Atlantic Shores has not been verified or approved by the developer or homeowners association. Please verify all information prior to purchasing. 55places.com is not responsible for any errors regarding the information displayed on this website.